NF-κB Signaling | Signaling Pathways | BioVision, Inc.
Nuclear factor-kappa B (NF-κB) is a very important transcription factor that regulates key genes involved in inflammation, tumorigenesis, apoptosis, autoimmune disorders, and inflammation. NF-κB is activated in response to proinflammatory cytokines, stress, UV rays, lymphokines, viral antigens etc. This transcription factor in its inactive form is generally sequestered in the cytoplasm, bound to inhibitor of kappa B (IκB). NF-κB is a fast-acting transcription factor because it does not have to be transcribed and translated after the harmful cellular stimuli, as it is already present in the cytoplasm. Appropriate stimuli for e.g. binding of the bacterial antigen LPS (lipopolysaccharide) to its Toll-like-receptors (TLR), or tumor necrosis factor (TNF) binding to its receptor TNFR etc. initiates the signaling pathway. The nuclear localization signal (NLS) of NF-κB is masked by its binding to IκB in the cytoplasm. In the presence of appropriate stimuli, the IκB kinase (IKK) phosphorylates serine residues on IκB's, which are then degraded by ubiquitination. With the exposed NLS, the NF-κB now translocates into the nucleus, where it binds to specific cis-acting elements on specific genes, thereby resulting in their transcription. These genes are responsible for key physiological responses like cell survival, proliferation, inflammatory or immune response. NF-κB also regulates the expression of IκB which is transcribed and translated. This newly formed IκB now sequesters NF-κB again into the cytoplasm, thereby resulting in a feed-back loop. Since NF-κB is so actively involved in a number of key events like cell proliferation and cell survival, many cancer cells have constitutively active NF-κB with mutations. Specifically blocking its expression in tumor cells may cause these active proliferating cells to die. 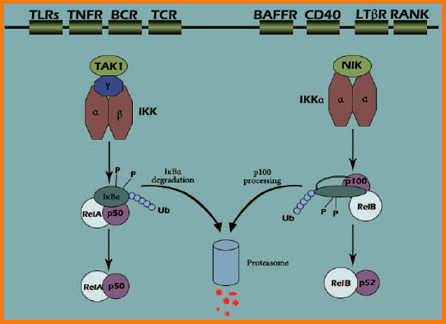 Hence, currently, several pharmaceutical companies have active programs to develop anti-cancer and anti-inflammatory drugs that function via blockade of the NF-κB signaling pathway.